This year pupils face a public examination in I.T after completion of learning in Std. 8 and 9. The relevance of IT is that it is a major tool to transact curriculum objectives as well as a subject of public Exam. Therefore, the HSAs who teach different subjects should be the ones who handle I.T in classes. One of the major problems facing pupils in preparing continuous evaluation tools in the non- availability of sources of information. We can solve this problem through I.T to a certain extent. Internet is not the only basic source of information through IT. But, a lot of CDs on education are easily available today. The Government itself has supplied Encarta Encyclopedia and CD on learning materials to all schools. Pupils can very well collect basic information to achieve the educational objectives. By doing project in IT, it is aimed at formulation of CE tools. 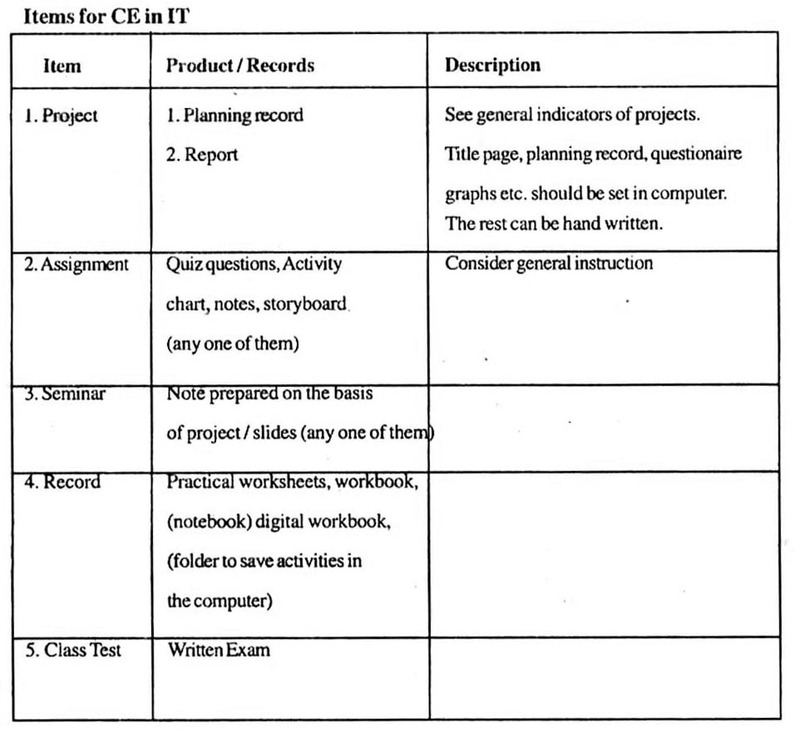 The difference of IT projects from other projects is its paper, questionnaire, graphs etc. The time-bound planning of the project and project report are to be evaluated. Notes based on the findings of the projects are to be presented in the seminar. For this one can make use of multimedia presentation also. The slides and notes may be treated as seminar records. Worksheets, workbook, digital work book etc. prepared the pupils as a part of preparation for practical work may be considered as records.